It's the water that accumulates below the earth's surface, filling empty spaces and cracks in the rock. Farmers and agencies can tap it by drilling wells. It's an especially valuable source of water during times of drought, providing 60 percent of the state's supply as reservoirs, rivers and other sources dry up. Some farmers even turn to dowsers, or water witches, to guide them to the underwater reserves. About 30 million Californians rely on groundwater for some portion of their drinking water supply, according to state figures. Some areas are being pumped faster than they can be replenished with rain, snowmelt and irrigation runoff. And as California faces the third year of a serious drought, farmers have been in an expensive race to drill the deepest wells. Over-pumping can compress soil and rocks, making them more compact and permanently reducing the underground water storage capacity. That also leads to sinking land, or subsidence, which can damage roads, canals and other structures. How Is Groundwater Managed Now? Not very closely. Under California's Gold Rush-era water rights system, many landowners are entitled to pump as much as they please on their property. Other states treat groundwater as a shared resource regulated and monitored by state agencies. Some local agencies in California have sustainable plans for managing groundwater, but no statewide standards currently exist. The legislation signed Tuesday maintains a local approach with state oversight. It requires agencies in fast-depleting basins to draw up sustainability plans and allows for water meters and fines for monitoring and enforcement. It does not go as far as other Western states by granting state agencies the power to authorize or prohibit groundwater withdrawals, but the California Water Resources Control Board can now intervene if locals fail to act or come up with inadequate solutions. The state water department identifies 127 groundwater basins and sub-basins that are high or medium priority for monitoring, mostly concentrated along the agriculture-heavy Central Valley and some areas surrounding Los Angeles. That's only a quarter of all California groundwater basins, but they account for almost 96 percent of California's groundwater pumping. How Will the New Laws Roll Out? First, local land planners have until 2017 to choose or establish a groundwater sustainability agency. Those agencies then have until 2020 or 2022, depending on how dire their situation is, to draw up sustainability plans. Those plans should put groundwater basins on a path to sustainability by 2040.
Who Supports and Who Opposes the Laws? Democratic lawmakers pushed the legislation, ultimately winning support from key groups that include the Association of California Water Agencies and Metropolitan Water District of Southern California. But Republicans and some Central Valley Democrats opposed the bills, saying they would infringe on property rights and hurt well-managed agencies. 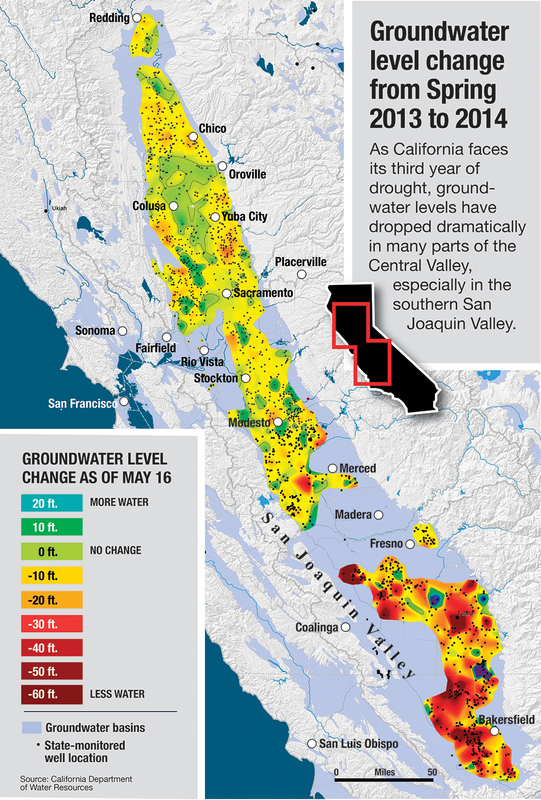 The legislation drew the ire of some agricultural interests that are increasingly dependent on groundwater, such as the California Farm Bureau.